VMware VMworld is around the corner and soon after Microsoft Ignite will open its doors. My blog sponsors, the companies that have an advertisement on my blog, will be there as well. some of them on both conferences and some on a specific one. I want to make sure you know they are at the conferences, where they are and that you should visit them. My sponsors range from workspace related companies to monitoring companies and a backup company. They create cutting edge technology and I think they deserve the attention at conferences. I’ll show you where they are going to and where to find them on the floor. Still about a month away but closing in is Microsoft Ignite. Microsoft main event during the year and if you’re a Microsoft consultant the place to be. At the conference you will find Savision and be sure to check them out. They got two main solutions; Savision iQ and Live Maps. Live Maps is what you need to make Microsoft SCOM a working product. With live maps you create business dashboard and topologies that actually show information hidden in a SCOM environment. There new product is called Savision iQ which is like an aggregator of all the data you IT department has to deal with monitoring environments. IT will combine those inputs into a logical readable solution and save you a ton of work. it offers a very powerful search interface and easy to use customer dashboards. I’m pretty sure you like this so check them out and say hi to them from me. They got two booths on the floor at Microsoft Ignite, one for each product. Savision iQ is at booth 1113 and Live Maps is at booth 1262. ControlUp is also found at Microsoft Ignite, they create a cutting edge monitoring tool but different from what Savision is doing. ControlUp is not working with SCOM but relies on it’s own agents to gather data. They offer next to the monitoring tool a logon simulator that is offered for free and they are developing in high speed. Many new features are there to be seen. Next to that they also have a app profiler which again is free, it can be used to monitor the performance of an application. 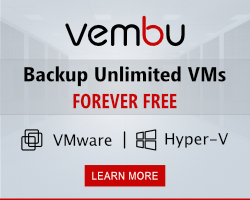 One of my new sponsors is Vembu Technologies, they create a very good backup and distater recovery solution. I’m not a BDR savy but will join them at the conference to get up to speed on what they are offering. The Vembu solution fits in any organization whether it is a small environment or a large enterprise. It is compatible with VMware vSphere and Microsoft Hyper-v, the leading hypervisors. They offer backup for physical, virtual environments but also cloud apps like Office365. so check out there image backup, network backup saas backup and so much more. They will be at VMware VMworld at the exhibition floor, they are at booth 119. Liquidware will be at VMware VMworld as they have been for years. Liquidware is the last surviving UEM solution out there. Everyone else that matters has been bought by a big vendor. LIquidware offers several products in the EUC Workspace; A User Environment Management solution called Profile Unity. A application delivery solution called FlexApp and a monitoring solution called Stratusphere. As you notice they can cover a great deal VMware or Citrix or anyone else can, so check them out at the floor. They just released the newest version of Profile Unity and they are working hard on improving FlexApps so enough to demo and talk about. They will be at VMware VMworld, you find them at booth 1126.
eG Innovations is a monitoring solution with a strong focus on monitoring the whole application chain. With eG Innovations you can build a topology of your application chain and get a complete overview of all dependencies. Alerting is done based on relevance of the alert in the chain so that a red alert can change to yellow is a more urgent alert is happening somewhere else in the chain. Next to their monitoring solution they offer a Citrix Logon simulator which is offered for free. The free logon simulator offers most functionality and the paid version offers the rich features. Next to this there is also a real user monitoring offering where you can see what really is happening on your web sites. So for customers with a online presence that would be very interesting. Check them out, they will be at VMware VMworld at booth 826. Last but not least is Goliath technologies, like eG a monitoring solution. Goliath is very strong in the Citrix monitoring offering and was offering a Logon simulator for a long time already. Goliath Technologies offers the logon simulator for more than just Citrix, also for VMware, Microsoft, Cerner and Epic. So if you got Epic and you need to monitor it check them out. Next to this they offer monitoring of Microsoft Azure and Amazon AWS. so your VMware DAAS solution can also be monitored. Check them out, they will be at VMware VMworld.